FANBOY PLANET.com . : chew-mason-savoy :. 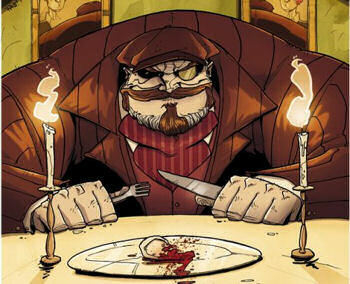 For over a year, we've known that John Layman and Rob Guillory's critically acclaimed comic Chew was being adapted into animation. Steven Yuen and Felicia Day had been announced as the leads right before Wondercon 2014. And now, after months of silence as they worked away, we just got a major piece of new casting. The Hollywood Reporter broke the news today that David Tennant has been cast as Mason Savoy, the mysterious cibopath who recruits Tony Chu into the twisted FDA of Chew's world. Both Savoy and Chu have the ability to psychically experience the history of anything they have eaten. In Chew, the government has given the FDA extensive enforcement powers in the wake of an outbreak of bird flu, but some believe it's part of a larger conspiracy. We reached out to co-creator John Layman, who has also written the screenplay for the animated film. "I can't tell you what a weird, incredible, awesome experience it is being in a studio and seeing somebody awesome, whose work you've enjoyed for years on TV and the big screen," Layman said. "David Tennant came in there with a strong idea for the character and his interpretation of Mason Savoy and totally knocked it out of the park. It was amazing. When the cartoon finally comes out, people are gonna be blown away by David's performance." Of course, fans are going to go wild over this. 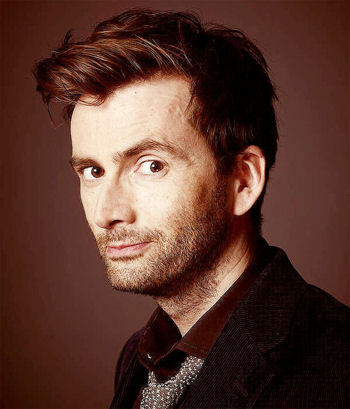 In addition to his work as Bertie Crouch (okay, and The 10th Doctor), Tennant as done voice-work for Star Wars: The Clone Wars, and been filming on Marvel's next Netflix series Jessica Jones as Kilgrave, aka The Purple Man. This role may really bring something even more different out of him, and it's exciting to us to hear the casting.